The strength of the SSA Master’s Program is integration. Although you’ll choose to concentrate in either clinical social work or social administration, you’ll gain a clear vision of the interconnectedness of individuals, communities, and agencies, and how policy and politics translate into meaningful change on the ground. This integrated approach will prepare you to be a force of positive change in people’s lives throughout a rewarding and varied career. 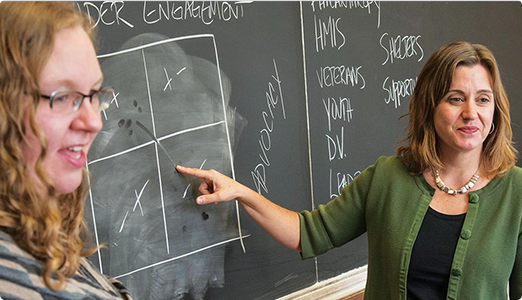 As an SSA doctoral student, you’ll have the opportunity to conduct groundbreaking and important research alongside both SSA mentors and renowned social scientists from across the University of Chicago. 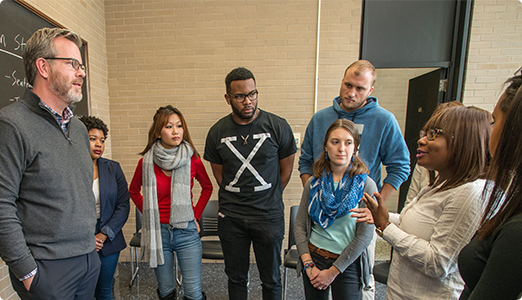 The program is designed to deepen your mastery of both social science theory and research methods so that you’re prepared to contribute to welfare scholarship in innovative and interdisciplinary ways. Grounded in the dynamic interplay of theory, research, and practice, SSA’s professional development workshops, review courses, and advanced clinical practice programs are intended to inform, but also to challenge you to integrate new learning into your daily practice. “I’d like to focus my research on education issues facing African American youth and foster youth. The end goal is becoming one of the leading researchers in education research,” he says.